Formchange is a mechanic introduced in Kingdom Hearts III. 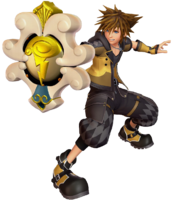 Formchange allows Sora to change his abilities or the form of his Keyblade. Formchanges are triggered via Situation Command after achieving sufficient damage with a Keyblade. Certain Keyblades will also have the ability to Formchange a second time. Formchange is a mechanic that borrows cosmetic and technical concepts from Command Styles and Drive Forms both, and allows Sora to manipulate his Keyblade's form similar to the wielders from Kingdom Hearts Birth by Sleep. The concept of having the Keyblade transformed into different forms has existed since Kingdom Hearts II Final Mix with the Lingering Will being able to transform the Ends of the Earth Keyblade into different forms. 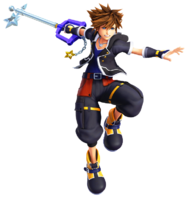 The idea was incorporate into Kingdom Hearts III's gameplay to show the growth of Sora's skill as he trained and become a more masterful Keyblade wielder. Second Form allows Sora to access his abilities from previous adventures. Sora wears his Kingdom Hearts II outfit. It is triggered by the Kingdom Key, Starlight, Midnight Blue, Phantom Green, and Dawn Till Dusk. The Keyblade used determines the third level finisher. Guardian Form emphasizes defensive capabilities. Sora wears yellow clothing. Triggered by Hero's Origin, Hunny Spout, and Classic Tone. Strike Form emphasizes strong physical attacks. Sora wears red clothing and the form is similar to Valor Form. Triggered by Favorite Deputy, Happy Gear, and Wheel of Fate. The Formchanges are Hyper Hammer and Drill Punch (Favorite Deputy), Agile Claws and Twin Yo-Yos (Happy Gear), Highwind and Storm Flag (Wheel of Fate). Element Form emphasizes magic and long-range attacks. 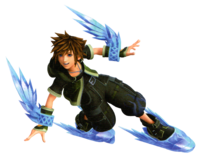 Sora wears blue clothing and the form is similar to Wisdom Form. Triggered by Shooting Star and Ever After. The Formchanges are Double Arrowguns and Magic Launcher (Shooting Star), and Mirage Staff (Ever After). Blitz Form emphasizes speed and mobility. Sora wears green clothing. Triggered by Crystal Snow, Nano Gear, and Grand Chef. The Formchanges are Blizzard Claws and Blizzard Blades (Crystal Snow), Nano Arms (Nano Gear), and Frying Pan (Grand Chef). 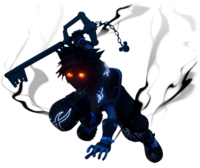 Rage Form allows Sora to channel his darkness in desperate circumstances. Sora takes on the appearance of a Pureblood Heartless, similar to AntiForm. It has a chance of being triggered when Sora reaches critical health, regardless of current Keyblade. Ultimate Form unleashes the ultimate power of the Keyblade. Sora wears white clothes, similar to Final Form. Triggered by Ultima Weapon.